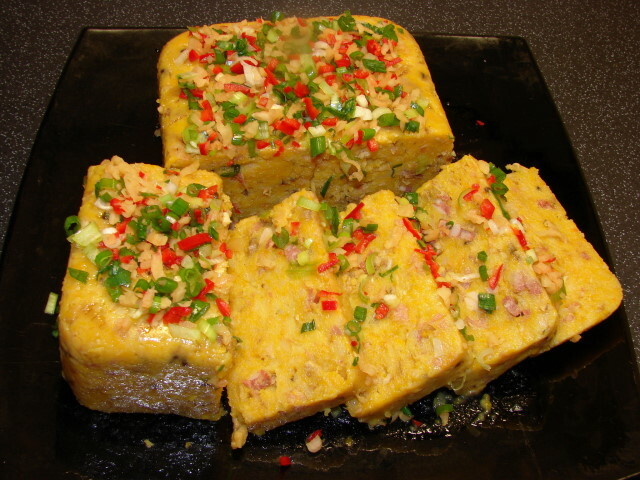 One of Cantonese favourite Chinese New Year's cake is lo bak goh (turnip or mooli cake). This year I subbed mooli with pumpkin. 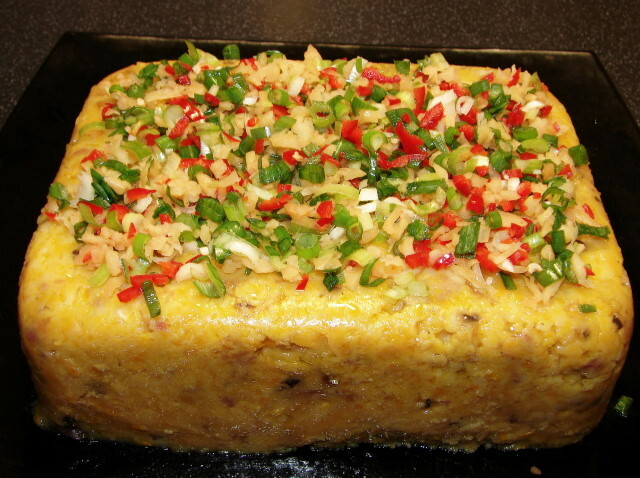 The cake has a mild sweetness and lovely pumpkin flavour. It has a nice golden colour. Gold or golden colour is auspicious during CNY to symbolise wealth and prosperity. So why not try this to celebrate with friends and family. I know it's a bit late but CNY is not ended till 17th Feb.
Soak the lap cheong in boiling liquid for few minutes till soften then finely chopped. Grate pumpkin using a cheese grater or grate with food processor coarse grater attachment. Mix rice flour and stock (or water) together. Heat wok, add cooking oil and sesame oil and fry shallot and garlic till golden. Then add lap cheong, minced pork, mushroom and dried shrimps or scallop (if using). Stir fry till fragrant and make sure meat does not clump together then add remaining seasoning ingredients. Add grated pumpkin stir briefly then add 1/2 cup water. Continue stirring for few minutes till the mixture is thoroughly heated through. Grease 2 - 3 aluminium foil baking tins (round or oblong). Spoon cake mixture into containers, press firmly to ensure no air pockets in the cake mixture. Smooth the top with dampen fingers lightly touching the surface. Ready for steaming. Preheat steamer till very hot. Put cake in steamer loosely covered with baking paper, steam at medium heat for about 1 - 1.5 hours depending on thickness of cake. Cake less than 1.5 inches thick will take about 1 hour, cake about 2 - 2.5 inches thick will take about 1.5 hours. Test with a skewer around the centre to see there is no whitish paste to ensure it is thoroughly cooked through. Covering cake with baking paper is to prevent condensation collected on top of cake and making it soggy wet. Once cooked, take the cake out, lightly brush with oil and cover loosely then leave to cool. Brushing with oil is to prevent surface drying. This cake is too soft to cut when hot. Better put in fridge after cooling. Turn the cake out. Garnish with chopped spring onion, chilli and preserved turnip. This salted turnip gives a salty taste and a bit of crunch. Cake can be eaten while warm better still cut into slices after cooling (chilling) and fry with a little oil till golden. * If without a large enough steamer can cook the cake in the oven using a water bath (large roasting tray filled with some boiling water) covered with foil. This cake is suitable for freezing. Defrost before cutting and frying. Wow, this dish is something very special, thanks for the recipe. Coming home with me. Thanks for the comment Ana. 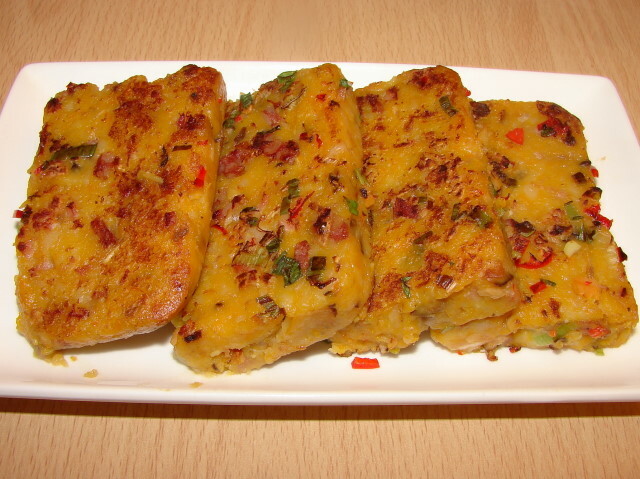 I have eaten radish cake and yam cake but not pumpkin cake.this looks very delicious. Love the yellow colour. I need to try one day, Thanks very much for sharing. Just love the golden colour that this pumpkin cake brings out... thanks for sharing the recipe. This looks lovely. Never heard of this dish but will have to try it. I just started following your blog last month and love it. I'm a diehard fan of "didao" Chinese food and am picking up some great recipes from this site.